PVC Plastic Sheets are supplied in full range of sizes and colours by IPSL. PVC is an incredibly tough and durable material in sheet format, it is resistant to a wide range of chemicals and keeps its mechanical properties from -20 to +60 degrees Centigrade. Suitable for all critical clean areas including (but not limited to): Food Production and Preparation, Butchers, Meat plants, Kitchens, Takeaways, Milking Parlours, Dairies, Schools, Hospitals and Veterinary Surgeries, Showers, Laboratories. For the larger project IPSL can provide a full service; from initial advice, through design and tendering, to managing and delivering the entire installation including walls, ceilings and floors. We offer welded joints and thermoformed corners as options. We have installation teams able to work all over the UK. Proclad Hygienic Systems have been carefully designed so that they have the advantage of a straight forward installation for either a self install or an experienced tradesman. This allows you to keep costs to a minimum while keeping total control over the project. Poly Vinyl Chloride (PVC) is a thermoplastic material made of 57% chlorine (derived from salt) and 43% carbon (from oil). It uses less oil than other polymers, and is sometimes can be regarded as a natural resource efficient plastic. Chlorine also gives to PVC excellent fire resistance:PVC is self extinguishing as it will not support and flame once the source is removed.This does not make PVC non flammable, but to burn it a continuous source of flame must be applied. This entry was posted in Hygienic Cladding on December 21st, 2009 by IPSL. The ethos of Toppings has always been to use only 100% natural high quality ingredients. Using the same traditional recipes used in their home this family run business has multi-award winning products. When it came to choosing a product to finish off their staff facilities Toppings turned to Proclad. 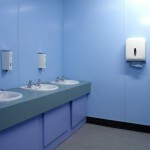 Proclad offers a range of PVC wall and ceiling finishes that are hygienic, low maintenance, and easy to clean – it can be wiped down, hosed down or even pressure cleaned to keep its original cleanliness. It is more cost effective, grout free, and has excellent chemical and durability qualities. 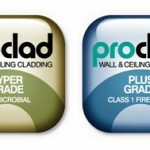 All Proclad wall and ceiling products meet all EU directives on health and hygiene. Plus, they come fire rated as standard. This entry was posted in Wall & Ceiling Cladding on December 1st, 2009 by IPSL. Counthill School was opened in 1951 and consists of approximately 1100 pupils, 80 teaching staff and around 60 support staff. The buildings at Counthill are of the period, and like most similar facilities, they have used tiles throughout the toilet areas. Over time these have become chipped and broken; grouting has deteriorated and in some cases fallen out. Overall these areas had become unsightly, difficult to clean, and unhygienic. Counthill needed to improve the areas and so Spire Construction were brought in to complete the works. 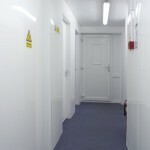 Proclad uPVC Hygienic Cladding was chosen and fitted over the holiday closure period. They chose a pastel shade of blue, but pastel shades of cream, green, and grey are also available, all with matching fittings. The resultant job is a fantastic appearance, very easy to clean, and importantly maintenance free! This entry was posted in Hygienic Cladding on December 1st, 2009 by IPSL.